Bachmann Trains REMOTE TURNOUT - RIGHT (1/card) - N Scale. 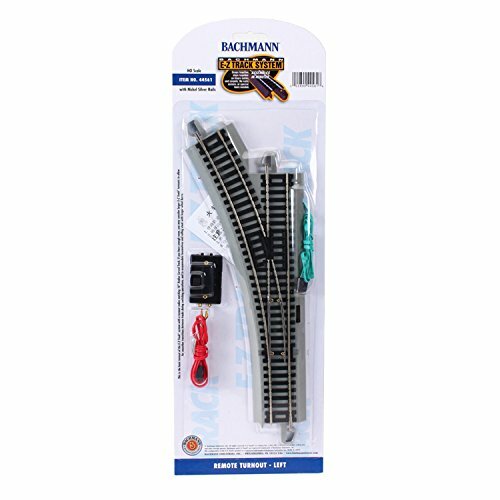 Bachmann's exclusive E-Z Track system makes set-up quick, easy and fun. Nickel Silver Rail with Grey Roadbed. E-Z Track System - Snaps Together, Stays Together on Floors, Tables and Carpets. Bachmann Trains REMOTE TURNOUT - LEFT (1/card) - N Scale. Bachmann's exclusive E-Z Track system makes set-up quick, easy and fun. Nickel Silver Rail with Grey Roadbed. E-Z Track System - Snaps Together, Stays Together on Floors, Tables and Carpets. PC type (gray color) track, right hand, trimmed track. 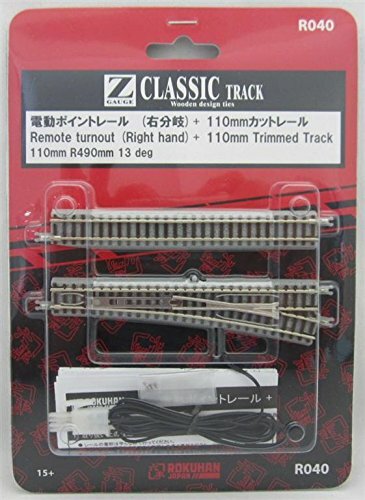 Straight Track 110mm Long, Curve Track R490-13 degree,1 x 110mm Trimmed Straight Track, Right Hand Remote Turnout, 1 Turnout per Package. 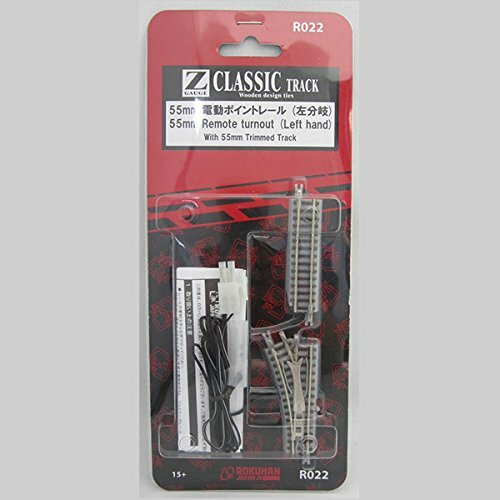 Features of Rokuhan Track: Roadbed track with 6.5mm track gauge, Nickel silver rail is used due to its excellent electrical conductivity. (Some track parts are stainless steel) The rail joiners can be easily changed if they are damaged. Special ordered "H" shaped rails are used. To reduce the electric resistance, the cross-sectional area of the rail has been widened. Every section of straight track has a power feed point. Your engine will run better if you feed power to several points. Every Power feed point has a cover which maintains the track's appearance when you are not using a power feed point. The facing surfaces to wheel tire tread and the top of the rail are widened. This helps the grip of wheels and traction tires to be stronger. Our lineup was started with our "Classic track" series which simulates track with wooden ties. This series matches older type of trains. PC type (gray color) track, left hand, trimmed track. Straight Track 110mm Long, Curve Track R490-13 degree,1 x 110mm Trimmed Straight Track, Left Hand Remote Turnout, 1 Turnout per Package. Features of Rokuhan Track: Roadbed track with 6.5mm track gauge, Nickel silver rail is used due to its excellent electrical conductivity. (Some track parts are stainless steel) The rail joiners can be easily changed if they are damaged. Special ordered "H" shaped rails are used. To reduce the electric resistance, the cross-sectional area of the rail has been widened. Every section of straight track has a power feed point. Your engine will run better if you feed power to several points. Every Power feed point has a cover which maintains the track's appearance when you are not using a power feed point. The facing surfaces to wheel tire tread and the top of the rail are widened. This helps the grip of wheels and traction tires to be stronger. Our lineup was started with our "Classic track" series which simulates track with wooden ties. This series matches older type of trains. 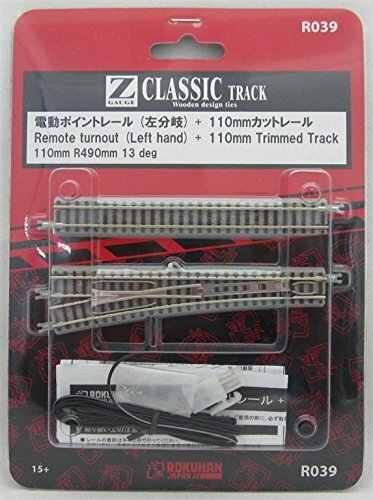 Product Information Nickel silver track with gray roadbed; 1/box Connects parallel tracks, allowing equipment with longer wheelbases to cross over smoothly and at higher speeds. Note: All analog turnouts (non-DCC) require AC accessory power supply for operation. The Power Pack and Speed Controller included in our N/HO/On30 train sets (also available separately as Item No. 44212) is equipped with AC accessory terminals. WARNING: CHOKING HAZARD - SMALL PARTS! NOT INTENDED FOR CHILDREN UNDER 3. This Package Contains One HO Scale Electrically Operated #6 Crossover (Left) Switch E-Z Track with Nickel Silver Rail and Two Controllers from Bachmann. Quick and easy installation!. 2 burn-out proof controllers for independent turnout operation. Connector wires provided. Manual control. Nickel silver rail and connectors. Gray roadbed. Scale black railroad tie dimensions with molded-in wood grain detail. Electrically wired frogs. The turnouts are not polarized, but can be easily. Switch assembly instruction provided. No additional power pack connections are required. Includes:. One HO 6 Crossover Switch (Left). Two Controllers. Scale: HO (1:87). Length: 21-1/4" (54cm). Combined Width: 4-1/4" (10.8cm). 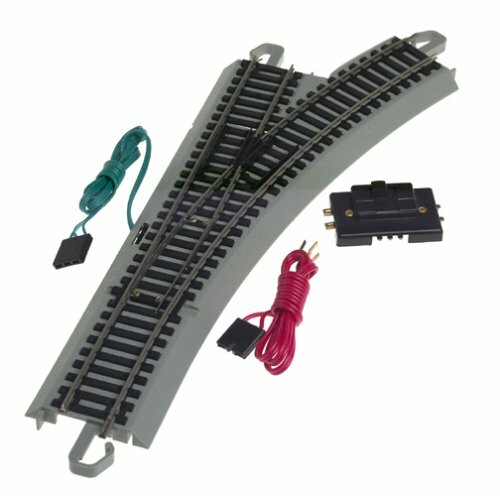 Features:Straight Track 55mm Long, Curve Track R127-26 degree, 1 x 55mm Trimmed Straight Track, 40" Wire w/ Connector (100 cm), 1 Turnout per Package. Features of Rokuhan Track: Roadbed track with 6.5mm track gauge, Nickel silver rail is used due to its excellent electrical conductivity. (Some track parts are stainless steel) The rail joiners can be easily changed if they are damaged. Special ordered "H" shaped rails are used. To reduce the electric resistance, the cross-sectional area of the rail has been widened. Every section of straight track has a power feed point. Your engine will run better if you feed power to several points. Every Power feed point has a cover which maintains the track's appearance when you are not using a power feed point. The facing surfaces to wheel tire tread and the top of the rail are widened. This helps the grip of wheels and traction tires to be stronger. Our lineup was started with our "Classic track" series which simulates track with wooden ties. This series matches older type of trains.